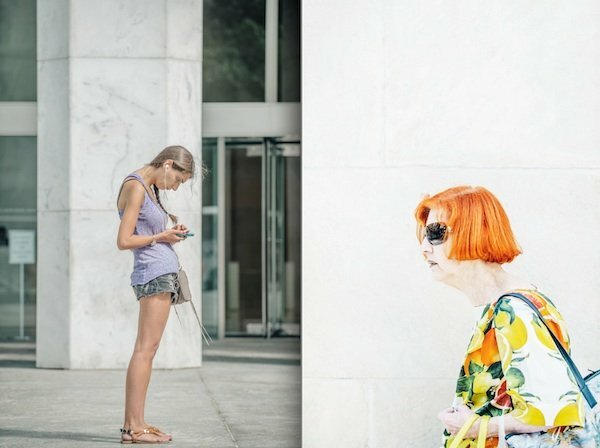 AI-AP | Profiles » Photographer Profile - Daniel Featherstone: "It's more street portraiture than street photography"
Photographer Profile - Daniel Featherstone: "It's more street portraiture than street photography"
“There’s a serendipitous quality about that, he says. The intersection also happens to be a convenient spot for him to shoot. By day, Featherstone works as a graphic designer at apparel company Nautica, which has offices just around the corner from 57th and Fifth. But not all day: He spends his lunch breaks shooting people on the sidewalks nearby. The photographer most closely associated with 57th and Fifth is the late Bill Cunningham, who rode his bicycle there year after year to document what clothes people were wearing. When Cunningham died last June at age 87, The New York Times, where his pictures appeared, noted that he had turned fashion into a kind of cultural anthropology, “chronicling an era’s ever-changing social scene.” Likewise, Featherstone’s pictures can be be viewed in a sociological context. 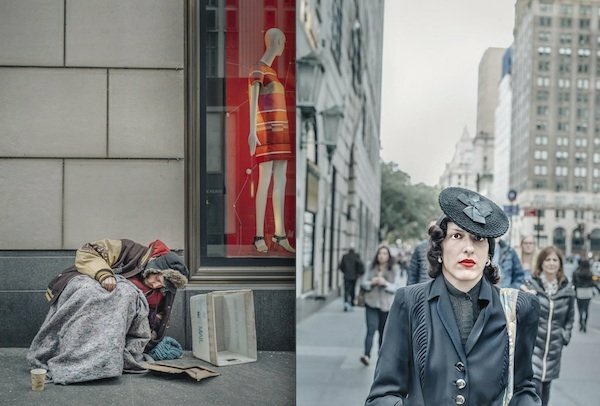 “You can’t help that when there’s a homeless man outside of Bergdorf Goodman and a wealthy socialite is walking in front of him,” he says. But his pictures — whether they’re street photography or street portraiture — are less about sociology than individuals. 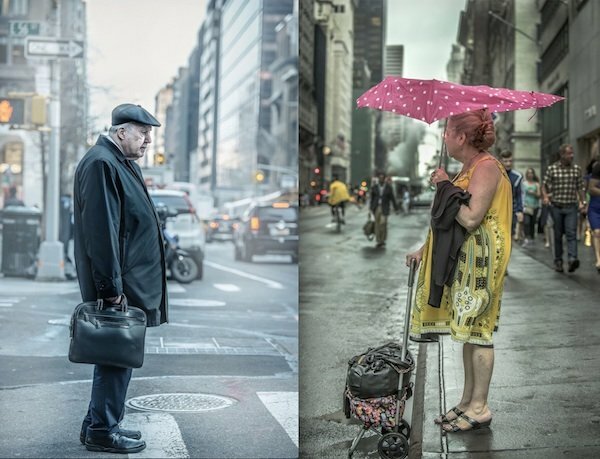 He looks for the character of New York in the characters he sees at its most photographed crossroads. His pictures are about faces — some surprised by his presence, some welcoming, some unaware of it. Fashion is an element in his pictures — a woman in an enormous fur coat and towering feathered hat here, another one there perched on a curb in a thin wrinkled dress, holding a cane in one hand and battered umbrella in the other. “But I’m really not that interested in the fashion, to be honest, even though I work in fashion,” he says. Featherstone is from the south of England, where, in the 1980s, he was a graffiti writer. It was then that he picked up photography, if only as a way to document his work. He’s been in the U.S. for 23 years — “about half my life,” he notes — working as a graphic designer and art director. He says it was about 10 years ago that he began to take his photography seriously. “I was never really interested in shooting people, though. I was interested in more of an abstract approach,” he says. That camera, a Nikon D810, is more conspicuous than the iPhone, but Featherstone says most of the people he shoots are oblivious to him. He switches between two lenses, a 50mm prime and a 70-200mm zoom. “I love the dynamic range and sharpness of the 50mm lens, and I have no problem approaching people and shooting very close up, but I do like the pictures I get with the 70-200mm lens. It compresses the images and they're more flattering,” he says. On those occasions when he feels like shooting with film, Featherstone uses a Linhof Techika III or Hasselblad 500 C/M. One of the distinguishing features of Featherstone’s pictures is the light: Shooting in the midday, he captures faces illuminated by the surrounding reflective architecture. (He’s currently teaching a course called Available Light Photography at Parsons School of Design at The New School.) His post-production work also adds interest. “My attention to detail, color balance and texture is a direct connection to my other life as a graphic designer and artist,” he told one interviewer. He’s seen his share of famous faces at 57th and Fifth, including Kim Kardashian, who didn’t interest him. “You know, whatever,” he says. 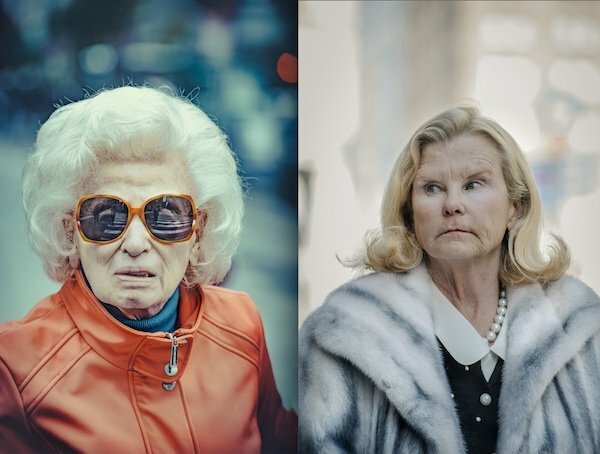 “The characters that I interact with range from the plastic surgery aristocracy to naive tourists to the underprivileged homeless; they are all present,” Featherstone told Feature Shoot. The first person he shot for the series was an orthodox Jewish man; he says he was afraid the man was going to yell at him, but he didn’t. Thereafter he grew more confident about photographing strangers. 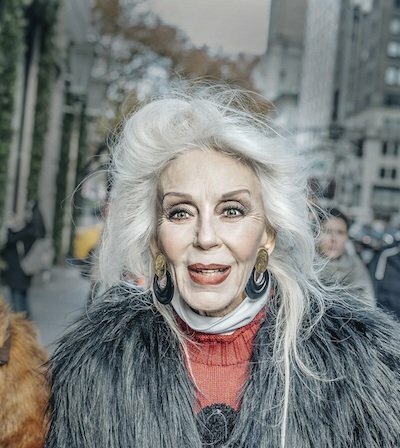 His best known image features one of the regulars in the area — a woman with a flamboyant flash of gray hair and the various accoutrements of wealth. 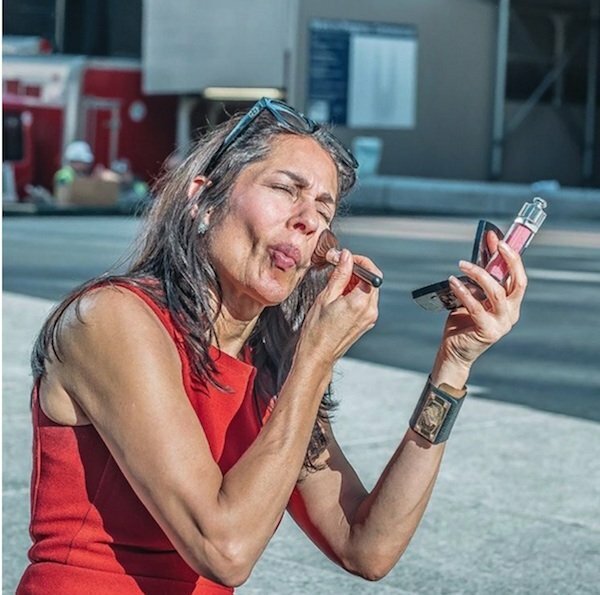 The same woman, he notes, has turned up in the work of other Instagrammers who patrol the neighborhood. Street photography has become hugely popular in recent years, due in large part to smartphone cameras and online photo-sharing sites, and on any given lunch hour you may spy a number of photographers documenting the interesting and varied people who parade along the sidewalks at 57th and Fifth. 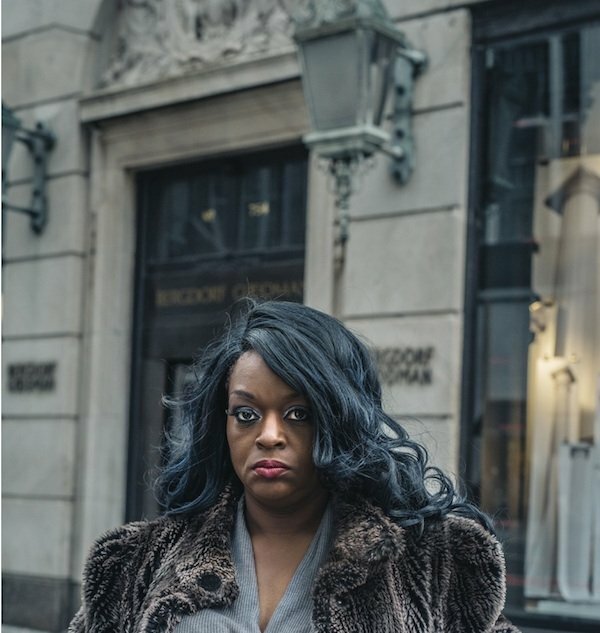 Daniel Featherstone’s pictures are about the people, not the pageant.